THE CAVE OF SHOOTING - 1998 - ESP Ra.De. An evil establishment controls politics and the financial world of Tokyo in the year 2018. Now even an invasion of clones is planned to replace all the humans in the city. Choose one out of three characters with Extra Sensory Powers (ESP) to save Tokyo and to destroy the female boss behind all of this. 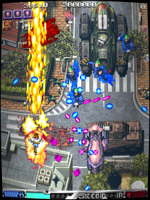 This is the background story of the vertical scrolling shoot'em up game ESP Ra.De. (speak "Esprade"). This story was (very roughly) translated by me - feel free to send me an email if you come across a better translation. By pressing Button [A] you can release a well packed ray bundle at your enemies. This is your standard weapon. Button [B] is some kind of a piercing gun. Similar to the one in Takumi's 'Mars Matrix', at least in effect. This is a great weapon to "crack" bigger ships and bosses. Hold Button [C] to charge an ultra wide fire boost of disastrous destruction. It also makes you invincible from the beginning of charging until it has burnt out. You might consider to use the charge of this weapon as a protection from enemy bullets. Sure you can do this, but CAVE didn't want you to use this kinda cheat too often. So don't be surprised to see your energy-meter going down very fast, even when you hold the button for short times only. The main gun and energy of that sorta smartbomb boost can be upgraded or refilled by collecting specific items throughout the game. ESP RA.DE. features an interesting cycling system to porvide you with these items. Check 'Items & Scores' to learn more about it. ESP Ra.De. is indeed one of the most beautiful shooter games in existence. The manufacturer has put very much love and effort in this masterpiece to create stunning graphics with a myriad of details. Also the music score is a thrilling experience you want to listen again and again. In fact there is just one thing I'm not satisfied with this game: It is very short.You play 3 levels in random order. The first one depends on which character you chose. After that, there are 2 more levels to be played before you enter the building of the final boss. Collectors might experience that ESP Ra.De. Jamma PCBs are quite rare and expensive. If you have a chance to get this game for an affordable price, just do it !